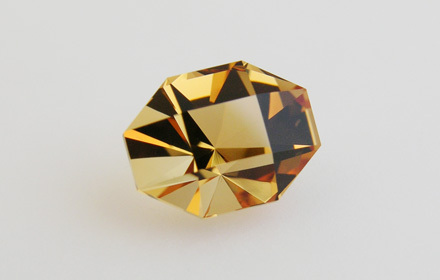 Weight: 1.27 ct; size: 7.72 | 5.92 | 5.26 mm; shape: octagon; colour: medium orange; very slightly brownish; clarity: eye clean; cut: excellent; treatment: heating. Probably heated amethyst. Very clean specimen; design ‘Uso Da!’ by Arya Akhavan, excellent cut by Tan Pen.